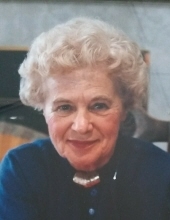 Mary Kochis, of Dyer, IN, passed away on March 20, 2019. Until her recent hospitalization, Mary was the leader of the St. Thomas More Vocations Committee; which included conducting a weekly vocations prayer service and contributing articles to the church bulletin. Mary was well known throughout the Northwest Indiana Catholic Community. She is survived by her sister: Helen Artim; her sister-in-law: Rose Yothment; many nieces, nephews, and friends. She was preceded in death by husband: Jacob Kochis; daughter: Janie Brown; husband: Art Brown; and eight brothers and sisters. Visitation with the family will be on Friday March 22, 2019 from 4-9 p.m. at Burns-Kish Funeral Home, 8415 Calumet Ave. Munster, IN. A Mass of Christian Burial will be held on Saturday March 23, 2019 at 10 a.m. at St. Thomas More Church, 8501 Calumet Ave. Munster, IN with Fr. Mike Yadron officiating. There will also be a half hour of visitation at the church prior to the mass. Interment will be at St. John-St. Joseph Cemetery in Hammond, IN. Mary will be remembered as a very generous, loving, and helpful person. In lieu of flowers; donations can be made to the Diocese of Gary Vocation Office in her loving memory. To send flowers or a remembrance gift to the family of Mary C. Kochis, please visit our Tribute Store. "Email Address" would like to share the life celebration of Mary C. Kochis. Click on the "link" to go to share a favorite memory or leave a condolence message for the family.